Limit 1 per customer. 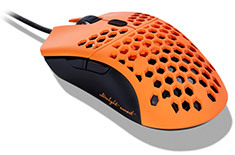 The Ultralight Sunset utilises a special coating Finalmouse developed called FINALGRIP. With a unique hybrid rubber composite the FINALGRIP coating provides a more soft touch grip along with a lustrous two tone sunset finish. Due to the more consuming and meticulous process of applying FINALGRIP to the ULP's honeycombs the Ultralight Sunset will be produced in limited quantities. The end game of eSports mice is finally here. The true Finalmouse years in the making. An industry standard that Professional Gamer's all over the world will utilise for years to come. With a perfect shape, flawless sensor, and as light as a feather... this is THE competition mouse. When Finalmouse set out to make the best eSports mouse ever made, they asked themselves, how does one create the ultimate extension of the hand? How does one reach the point of ultimate harmony between the mind, the hand, and the game. Some may say it's with RGB lights, some say wireless with batteries the weight of bricks. Others may say its about modularity, transformer pieces coming together in an assortment of ways. Finalmouse would like to propose an alternative path of thinking. That maybe, the best eSports mouse is one you never feel. One that truly lets your mind, your hand, and the game become one. So we made the Ultralight Pro. So you can experience what it feels like, to feel nothing.